Please note: Email contact is preferred. Please scroll down below for our Contact Us form. 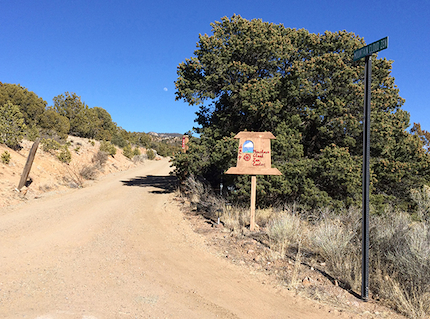 Find your way onto Old Santa Fe Trail and head south. Go through the Stop sign with Zia Road, and after about one mile look for a curve in the road to the left, immediately followed by a curve to the right. In the middle of the right curve, there is a dirt driveway on the Left. This is the Mountain Cloud entrace. It has an old metal gate (always open), a small wooden sign, as well as a green city street sign saying “Mountain Cloud Zen.” They are all easy to miss, and the curves in the road are the best guide. Take Exit 284 off I-25. If coming from the south, at the top of the exit ramp turn Left, heading North towards Santa Fe. Go over the bridge that brings you back over the freeway, and straight through the first traffic light onto Old Pecos Trail. In about half a mile, turn Right at the traffic light onto Zia Road. Go through three stop signs. At the fourth Stop, which is a T Junction, turn right. You’re now on Old Santa Fe Trail. After about one mile, look for a curve to the left immediately followed by a curve to the right. In the middle of the right curve, there is a dirt driveway on the Left. This is the Mountain Cloud entrance. It has an old metal gate (always open), a small wooden sign, as well as a green city street sign saying “Mountain Cloud Zen.” They are all easy to miss, and the curves in the road are the best guide.